The complex interrelated identities of Jewish and Palestinian Israelis—two peoples divided by a shared culture, to paraphrase Oscar Wilde’s reputed quip—is movingly explored in “A Borrowed Identity,” a sharply mounted drama about a young Arab who finds reasons to “pass” as Jewish. The film represents a merging of cultures in its origins too. It was directed by Eran Riklis, a leading Israeli filmmaker (“The Human Resources Manager,” “The Syrian Bride”), and scripted by acclaimed Arab-Israeli writer Seyad Kashua (“Dancing Arabs,” “Let It Be Morning”), based on his autobiographical fictions. The tale opens in an Arab village in the 1980s when the family of young Eyad (Razi Gabareen) are transfixed by the sight of Israeli jets attacking Lebanon on the TV news. Politics and war are much on everyone’s minds, but so are the bonds of family. Eyad is particularly close to his grandmother (Marlene Barjali), who advises him on her wishes for her burial, an event he hopes is far in the future. Eyad also looks up to his feisty, opinionated dad (Ali Suliman), a laborer who sees his son as the key to a brighter future. Many of the scenes of Eyad’s schooling are comical, as when as a Jewish-American peace activist comes into the classroom and tells the students he wants to build bridges between Jewish culture and theirs, and his Israeli translator translates this as saying that the Arab kids will never be anything but farmers and laborers. But school is also a serious place for Eyad; since he is the brightest of students, it offers the chance to propel himself into a better life. When the tale’s second act opens, it is the early ‘90s and Eyad (now Tawfeek Barhom) is a determined teen arriving at one of Jerusalem’s most prestigious boarding schools. He seems to be the only Arab student, and his Jewish fellows appear to view him with a mixture of curiosity and veiled suspicion. Bent on academic success, he does his best to fit in and make friends. One friend in particular adds to his new life’s delights and complications. Naomi (Danielle Kitsis) is a beautiful fellow student whose attraction to Eyad develops rapidly into romance, but one that’s eventually threatened by the various obstacles facing them, including those presented by her Jewish family. Thanks to the strong performances of the actors here, the film’s presentation of young love is impressively nuanced and persuasive. Eyad forges an important friendship outside of school with Yonatan (Michael Moshonov), a young man who’s homebound with muscular dystrophy. At first reaching out to him is an assignment and a chore, but the two soon bond over rock music. Eyad is also moved by Yonatan’s relationship with his mother, Edna (Yael Abeccassis). Eventually Eyad’s scholarly pursuits are derailed, much to his father’s annoyance and dismay, and he’s obliged to go to work. But gaining employment and even things like having a bank account are difficult for Arabs, so, in need of an Israeli identity, he lights on one—Yonatan’s. If going to a Jewish academy was a big jumping off point in his life, adopting a Jewish identity is an even bigger one. 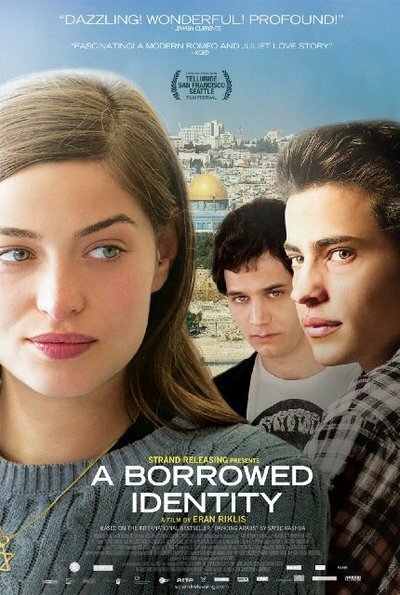 “A Borrowed Identity” commendably avoids polemics in order to provide a textured portrait of a young man going through a set of personal transitions against the background of ongoing cultural flux that reflects a larger, collective identity crisis. Its evocation of the historical period feels carefully honed and resonant. It’s not a film without flaws, however. Eyad’s relationships with his Jewish male friends at school could have stood deeper development. And his relationship with Naomi is not given a satisfying resolution but instead seems to get lost in the mounting emphasis on Yonatan and the new identity. All the same, “A Borrowed Life” emerges as one of the most engaging and polished of recent Israeli films, and as such is well worth the attention of anyone interested in the cultures and issues it limns.